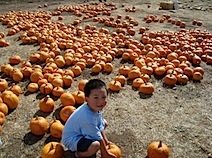 I took the day off today to chaperone my son’s pre-k trip to the Pumpkin Patch. I had two other boys to follow around and it felt like a five hour game of hide and seek. Or to mix metaphors, like they were blobs of mercury and could divide and flow into every little space in seconds. Except for my son, of course, the boys were heedless, running wherever their little brains thought they could find pleasure. One second, it was the bouncy house, then the slide, then the hay maze, or the hay ride. I was prepared for a lot of pleasure-oriented seeking, but not the heedless running, oblivious to either my yells or stern lectures. What a change from when I did this three years ago with my daughter’s kindergarten class. I was one of three dads who took the day off, among perhaps ten other moms. The odds seem to be getting better. All in all, we had a grand time, fitting in all the clichés of autumn harvest, except the Halloween allusions. One of the kindergarten teachers mused, “If aliens landed and saw us out here communing with the hay and pumpkins, what would they conclude? A religious rite, preparation for war (with catapulted orange missiles? ), or a harvest of the mainstay of our diet, the nutritious pumpkin. It was better not to dwell on this for too long or it would drain the entertainment value out of it.